A new "best of" album "25" was released in Norway on 19 July and in the UK on 4 October. It was also released in Austria, Czech Republic, Germany, Hungary, Poland and Slovakia (6 August); Japan and Spain (27 September? ); Australia, Belgium, Brazil, Canada, Eastern Europe, Finland, France, Greece, Ireland, Italy, Luxembourg, Netherlands, Portugal and Sweden (4 October) It is a 2 disc set featuring 39 tracks spanning the 25 years of a-ha. The final track on disc 2 is the last single "Butterfly, Butterfly (The Last Hurrah)". The album also features the "DJ Edit" of "Touchy!" and an edit of "I Call Your Name" (4:29). It is worth noting that unless specified, album versions of the tracks have been included, even where a single edit exists (TSASOTV, SMO, Velvet, FNY, Lifelines, Celice, FOTM). The front cover features a shot of a beach with two large rocks in the foreground. The new a-ha logo in white plus a large "25" in similar font but filled with an image of a cloudy sky are placed on the horizon against the sky. The back cover features another seaside shot with a lonely rock sitting in the centre of a pool. The track listings are printed in white down the middle. centre of a pool. The track listings are printed in white down the middle. The Norwegian version comes with a white circular sticker on the front displaying some printed text: "SE A-HA LIVE FOR SISTE GANG" in blue, and some tour dates in black; "21/8 Oslo, 28/8 Bergen, 2/9 Stavanger, 3/9 Tromso, 4/9 Trondheim, 11/9 Kristiansand". "SE A-HA LIVE FOR SISTE GANG" translates to "SEE A-HA LIVE FOR THE LAST TIME". The CD comes with a very glossy 8 page double sided booklet with grey-blue arty shots plus English text about the band's career and track information. The discs are silver with a large white "25" across the middle and a-ha logo in white on the left hand side. The centre of disc one has a grey ring where as disc two has a bright blue ring in the centre. The UK edition was also made in the E.U. and is identical to the Norwegian edition except for the sticker which comes on the front. The sticker on the Norwegian release is circular, white with blue and black text. The sticker on the UK edition is rectangular with blue with white text, it reads; "THE VERY BEST OF a-ha Celebrating 25 Years 38 Classics on 2CDs Featuring: Take On Me, The Sun Always Shines On T.V., The Living Daylights, Stay On These Roads, & Foot Of The Mountain PLUS the Brand New Track Butterfly, Butterfly 8122797968". The UK deluxe edition of "25" comes in a triple CD case with a bonus DVD of the videos. The artwork is similar to the regular release but the catalogue number differs. The booklet and back sleeve for the deluxe edition has the DVD track listing alongside the CD track lists. Discs 1 and 2 are identical to the regular release. There is a blue rectangular sticker on the front, similar to the one on the regular release, but is slightly larger with bigger font size text and advertises the bonus DVD, it reads; "THE VERY BEST OF a-ha Celebrating 25 Years 38 Classics on 2 CD’s Featuring: Take On Me, Hunting High And Low, Stay On These Roads, The Living Daylights, Cry Wolf, and brand-new track Butterfly Butterfly PLUS bonus DVD featuring 17 classic videos 8122 79790 4". The disc of the DVD is of similar design to the CDs, but the ring around the centre is in white and "DVD - THE VIDEOS" is printed in white on the right hand side. There are some editing issues on the DVD with "The Sun Always Shines On TV" including an additional piece of American footage tagged on the end! There is another UK promotional copy of the album which comes with an additional white rectangular "nonstop promotions" sticker with black printed text on the back sleeve; displaying some information on the release date and contact details, it reads; "nonstop promotions a-ha SINGLE: ‘BUTTERFLY, BUTTERFLY…’ - 27 SEPT ALBUM: ’25 – THE VERY BEST OF – 4 OCT. ‘To mark this monumental final year for the iconic pop band, Rhino are set to release the ultimate collection from a-ha’s 25-year career. Released on 4 October 2010, 25 – The Very Best Of will give fans the definitive set of the best-loved tracks from the Norwegian trio. Furthermore, exclusive to the release comes a-ha’s last ever recording and brand new single ‘Butterfly, Butterfly (The Last Hurrah)’. Niki Sanderson | Stuart Kenning 020 8334 9994 | [email protected]". Argentina: The CD and Deluxe Editions were both released in Argentina. They are similar to the EU releases but have a silver "ifpi" hologram sticker at the bottom front right hand corner. The usual "THE VERY BEST OF a-ha Celebrating 25 Years" blue sticker is also included on the front of the CD case, but the edges on it aren’t rounded compared to the European releases. At the bottom of the back sleeve, the Manufacturing and Copyright information is printed mainly in Spanish; "This Compilation ℗ & © 2010 Rhino Entertainment Company, a Warner Music Group Company. All Rights Reserved. Marketed by Rhino Entertainment Company. Publicado y distribuido por Warner Music Argentina S.A. A Warner Music Group Company. Miembro de CAPIF. Reservados todos los derechos del productor, de los autores y de los interpretes de las obras reproducidas en este ejemplar, prohibida la reproduccion, regrabacion, alquiler, prestamo, canje, ejecucion publica, radiodifusion y cualquier uso no autorizado de estos fonogramas. SADAIC – BIEM / AADI – CAPIF. INDUSTRIA ARGENTINA. LC02982". The regular "WB Records" and "RHINO" logos are shown, but an additional "WARNER MUSIC ARGENTINA" logo has been included. Both "www.a-ha.com" and "www.rhino.com" website addresses are also on display, along with the same white barcode as the European edition in the bottom left hand corner. Australia: The Australian CD release of "A-ha 25" comes with the regular artworks, but the additional blue sticker with white text; "THE VERY BEST OF a-ha Celebrating 25 Years 38 Classics on 2CDs Featuring: Take On Me, The Sun Always Shines On T.V., The Living Daylights, Stay On These Roads, & Foot Of The Mountain PLUS the Brand New Track Butterfly Butterfly" has been printed onto the actual front cover of the booklet. On the back sleeve the white barcode shown at the bottom left hand corner is much larger than on the European release and displays a different number "9 340650 007693". The regular "WB Records" and "RHINO" logos are also included, along with the "www.a-ha.com" and "www.rhino.com" website addresses. There is also some Australian manufacturing and distributing information printed along the bottom; "This Compilation ℗ 2010 Rhino Entertainment Company. Artwork © 2010 Rhino Entertainment Company, a Warner Music Group Company. All Rights Reserved. 8122797968. Marketed in Australia by Warner Music Australia Pty Limited under exclusive licence. Manufactured and distributed by Warner Music Australia. A Warner Music Group Company. wwwwarnermusic.com.au". The actual discs are again the usual silver with white text, but the same Manufacturing and distributing information which appears on the back sleeve has been printed instead at the lower half of each disc rather than around the centre rings. The Catalogue number 8122797968 on display is also the same as the European release. Brazil: The Brazilian CD album was "Manufactured and distributed by Sonopress under license to Warner Music Brasil Ltda". It is similar to the European pressing but the blue and white sticker on the front cover (of the earlier four issues only) has the text printed in Portuguese; "THE VERY BEST OF a-ha Celebrando 25 Anos 38 Classicos em 2CDs: Take On Me, The Sun Always Shines On T.V., The Living Daylights, Stay On These Roads, & Foot Of The Mountain MAIS a nova musica Butterfly, Butterfly 8122797968". On the back sleeve, the white barcode displaying the same number "0 8122 79796 8 3" as the European release is displayed at the bottom left hand corner. The Manufacturing, Production and Copyright information, mainly again all shown in Portuguese is printed along the bottom and reads; "© ℗ 2010 Rhino Entertainment Company, a Warner Music Group Company. All Rights Reserved. Warner Music Brasil Ltda, uma empresa Warner Music Group. Produzido no Polo Industrial de Manaus e distribuido por Sonopress Rimo Ind. e Com. Fonog. S.A.-Ind. Bras. Rua Ica, nº 100-A- Distrito Industrial – Manaus – AM – CNPJ 67.562.884/0004-91. Sob Licenca de Warner Music Brasil Ltda. – CNPJ 42.470.112/0012-09. Todos os direitos reservados. Prohibida a reproducao, execucao publica e locacao desautorizadas sob as penas da lei. O prazo de validade do disco CD ou DVD e indeterminado desde que observado os seguintes cuidados. Armazenar em local seco, livre de poeira, nao export ao sol, nao riscar, nao dobrar, nao engordurar, nao manter a uma temperature superior a 55°C e umidade acima de 60g/m3 e segurar o disco sempre pela lateral e pelo furo central. DISCO E CULTURA. Denuncie a pirataria: [email protected]". The back sleeve also includes the regular "WB Records" and "RHINO" logos, plus additionally the "PRODUZIDO NO POLO INDUSTRIAL DE MANAUS" flying Amazon bird and "COMPACT disc DIGITAL AUDIO" logos. The usual "www.a-ha.com" and "www.rhino.com" website addresses are also shown, but two additional Brazilian Warner Music website addresses have now been added; "www.warnermusic.com.br" and "www.warnermusicstore.com.br". The discs themselves are similar to the European edition being the usual silver with white text, the centre rings are again coloured pale blue for disc one and darker blue for disc two, although the size of them is slightly smaller on each. The Manufacturing, Production and Copyright Information has been printed instead around the outer rim of each disc rather than on the centre rings and displays some amended text similar to that displayed on the back sleeve, it reads; "© ℗ 2010 Rhino Entertainment Company. Warner Music Brasil Ltda. Produzido no Polo Industrial de Manaus e distribuido por Sonopress Rimo Ind. e Com. Fonog. S.A.-Ind. Bras - CNPJ 67-562.884/0004-91. Sob Licenca de Warner Music Brasil Ltda.-CNPJ 42.470.112/0012-09. Todos os direitos reservados. Proibida a reproducao, execucao publica e locacao desautorizadas sob as penas da lei. 812279796842.470.112/0012-09. Todos os direitos reservados. Proibida a reproducao, execucao publica e locacao desautorizadas sob as penas da lei. 8122797968". Also printed on the centre ring of the discs is the regular "WB Records" and "RHINO" logos, plus the "PRODUZIDO NO POLO INDUSTRIAL DE MANAUS" flying Amazon bird and "COMPACT disc DIGITAL AUDIO" logos. The release also comes with the regular European colour booklet but is slightly lighter in colour. There is also some additional batch issue coding displayed around the centre rings and on the actual spine of the CD case. At least seven editions are known to exist;- AA0002000, AB0002000, AC0001000, AD0001000, AF0001000, AG0000500 and AH0000500. Chile: The Chilean CD release is similar to the Argentine edition and also comes with the silver "ifpi" hologram and regular blue; "THE VERY BEST OF a-ha Celebrating 25 Years" stickers on the front cover. The album was Manufactured and distributed in Chile by "Musica & Marketing Ltda" and includes the same information, but printed in Spanish on the back sleeve; "This Compilation ℗ & © 2010 Rhino Entertainment Company, a Warner Music Group Company. All Rights Reserved. Marketed by Rhino Entertainment Company. Reservados todos los derechos del productor, de los autores y de los interpretes de las obras reproducidas en este ejemplar, prohibida la reproduccion, regrabacion, alquiler, prestamo, canje, ejecucion publica, radiodifusion y cualquier uso no autorizado de estos fonogramas. Fabricado y Distribuido por Musica & Marketing Chile Ltda, bajo licencia de Warner Music Chile S.A. Reservados todos los derechos. Ley 17.336 Hecho en Chile. El disco es cultura". The "MUSICA & MARKETING CHILE LTDA" logo is also displayed on the back sleeve, along with the regular "WB Records" and "RHINO" logos, plus the "www.a-ha.com" and "www.rhino.com" website addresses. The white barcode showing the European number "0 8122 79796 8 3" is also included at the bottom left hand corner. The inside of the CD contains the same European colour booklet but the colouring has been printed slightly lighter. The actual discs are again similar to the European release with DISC ONE being light blue and DISC TWO dark blue. The centre rings also include some revised Spanish Manufacturing and Copyright text which is missing the T at the start; Manufacturing and Copyright text which is missing the "T" at the start; "his Compilation ℗ & © 2010 Rhino Entertainment Company, a Warner Music Group Company. Publicado y distribuido por Warner Music Group Company. Fabricado y Distribuido por Musica & Marketing Chile Ltda. Bajo licencia Warner Music Chile. Reservados todos los derechos. Ley 17.336". The regular "WB Records" and "RHINO" logos are shown, plus the "MUSICA & MARKETING CHILE LTDA" logo and European Catalogue number 8122797968. The Chilean deluxe 2CD + 1DVD edition is similar to the UK and Argentine deluxe editions but comes with the same revised Spanish Manufacturing and Copyright information on the back sleeve as the regular Chile CD edition; "This Compilation ℗ & © 2010 Rhino Entertainment Company, a Warner Music Group Company. All Rights Reserved. Marketed by Rhino Entertainment Company. LC02982. Reservados todos los derechos del productor, de los autores y de los interpretes de las obras reproducidas en este ejemplar, prohibida la reproduccion, regrabacion, alquiler, prestamo, canje, ejecucion publica, radiodifusion y cualquier uso no autorizado de estos fonogramas. Fabricado y Distribuido por Musica & Marketing Chile Ltda. bajo licencia de Warner Music Chile S.A. Reservados todos los derechos. Ley 17.336 Hecho en Chile. El disco es cultura". It also includes some additional "Musica & Marketing Chile Ltda", "COMPACT disc DIGITAL AUDIO", "NTSC ALL REGIONS" and "DVD VIDEO" logos on the back sleeve. The regular blue rectangular sticker on the front is present but printed slightly darker than the UK edition, and there is also a silver "ifpi" hologram sticker included. The inside of the case includes the same CD/DVD booklet as the UK Edition displaying the Bonus Video listings near the end, but the colouring on it has again been printed slightly lighter. The same discs as regular Chilean CD edition are used, but an additional Chilean made Video disc has now been included. The centre ring on this is also white, and contains the same additional logos as on the back sleeve. The layout of the Catalogue number on each spine has also been printed slightly differently; 8122797904/8122-79790-4. India: The Indian release is very similar to the European release but has an additional silver "IMI" hologram sticker on the front cover, The regular blue "THE VERY BEST OF a-ha Celebrating 25 Years" sticker is also included. On the back sleeve, it includes some Indian Marketing, Manufacturing and Copyright information; "This Compilation ℗ & © 2010 Rhino Entertainment Company, a Warner Music Group Company. All Rights Reserved. Marketed by Rhino Entertainment Company. Unauthorized copying, hiring, lending, public performance, and broadcasting of this recording prohibited. Marketed & Distributed under exclusive license from WEA International Inc. by: Virgin Records (India) Pvt. Ltd. A-203/204. Navbharat Estate, Sewri (W). Mumbai – 15. Mfg. in India By: Futuristic Concepts Media Ltd. F-Wing. Tex Centre, Andheri (E) Mumbai – 72. This Sound Recording is for your personal and private use only. Any public performance would necessitate a License from Phonographic Performance Ltd., (PPL) and Indian Performing Right Society Ltd., (IPRS) under the Copyright Act. 1957 of India". There is also some addition information shown regarding the number of CD’s included in the album; "Contains Two (2 Nos.) pre-recorded compact discs. ", recommended retail price "M.R.P. ₹ 495/- inclusive of all taxes. ", plus a Consumer Complaints address; "Consumer Complaints: [email protected] or +91-22-2410 5001 or to the Distributor’s Address mentioned above". The regular white barcode is included near the bottom left hand corner which uses the same number as the European edition "0 8122 79796 8 3", but additionally contains a release date; "PKD. 10/2010". Also displayed along the bottom of the back sleeve is a pink musical note symbol containing a music website in which the album can be obtained; "Album also available on Ovi Music at http://music.ovi.com/in". The regular "WB Records" and "RHINO" logos are shown along with the usual "www.a-ha.com" and "www.rhino.com" website addresses. The actual discs are silver with the white a-ha logo printed on the left hand side, but the title "25" is displayed instead in silver rather than the usual white. The centre rings are pale blue for DISC ONE and dark blue with white text for DISC TWO, both display some Marketing and Manufacturing text; "This Compilation ℗ & © 2010 Rhino Entertainment Company, a Warner Music Group Company. All Rights Reserved. Marketed by Rhino Entertainment Company. Made in India. 8122797968". The "WB Records" and "RHINO" logos are again included. The centre rings also additionally come with an outer grey rim displaying some Matrix information; "VERY BEST OF A-HA DISC-2 VIRGIN WWW.FCML.NET". The album also includes the same European colour booklet and the same Catalogue number is used 8122797968. Indonesia: The Indonesian edition is similar to the European version, but the artwork is less shiny with more of a matt feel and on stiffer paper. There is a silver hologram sticker with "WARNER MUSIC INDONESIA" on the front of the regular booklet. There is also an orange and yellow "WARNER MUSIC/LUNAS PPN" leafed sticker stuck on the front cover. The discs also have a matt feel to them and appear frosted, rather than being the regular shiny silver, the text is again printed in the usual white. The centre rings come instead with some Indonesia Manufacturing information displayed on them which reads; "This Compilation ℗ & Ⓒ 2010 Rhino Entertainment Company, a Warner Music Group Company. All Rights Reserved. Marketed by Rhino Entertainment Company. Made in Indonesia. LC02982 8122797968". The regular "WB Records" and "RHINO" logos are included. On the back cover, the usual white barcode displaying the same number "0 8122 79796 8 3" as the European edition is shown in the bottom left hand corner, along with the regular "WB Records" and "RHINO" logos alongside, plus "www.a-ha.com" and "www.rhino.com" website addresses. The Indonesian Manufacturing, Marketing and Copyright Information is again shown along the bottom; "This Compilation ℗ & © 2010 Rhino Entertainment Company, a Warner Music Group Company. All Rights Reserved. Marketed by Warner Music Indonesia. Unauthorized copying, hiring, lending, public performance, and broadcasting of this recording prohibited. Manufactured in Indonesia. LC02982". The Catalogue number is 8122797968. Japan: The Japanese edition comes additionally with an obi-strip and the track listing differs compared to the European release. The front and spine of the obi strip is blue with white, yellow and light blue text. There is a picture of the band from the early years displayed at the top of the front obi with "a-ha 25" and the title printed twice in Japanese underneath. There is also some other Japanese text included in-between shown down the middle and in white. At the bottom of the front obi, it shows "2CD" in blue on a white background, plus some further white Japanese text is also included. A date of 21.3.11 and price tag ¥3.480 is additionally shown along with the regular "WB Records" and "RHINO" logos. The spine again comes with the "2CD" logo in white at the top with the blue and yellow Japanese title down the centre. A blue "Warner Music Group" logo and Catalogue number WPCR 13946/7 in black on a white background is displayed at the bottom. The reverse of the obi is coloured bluish/grey, and has a similar background to the back sleeve of the album, the tracks are printed in Japanese and displayed in white. Small pictures advertising other albums available; "Hunting High And Low" and "Scoundrel Days" are printed at the lower half of the obi on a white background with the text in black. A white barcode containing a different number "4 943674 101252" compared to the European release is also included, along with the "COMPACT disc DIGITAL AUDIO" and "STEREO" logos. The release date of the album 22.9.10 and "MADE IN JAPAN" is additionally shown. There is also a white "40 anniversary Warner Music Japan" sticker included on the front of the CD case. The Japanese CD itself has two less tracks than the European release and the 37 tracks are in a completely different order. "There's Never A Forever Thing", "Early Morning", "Cold As Stone", "The Sun Never Shone That Day", "Forever Not Yours", "Did Anyone Approach You? ", "Celice", "Cosy Prisons" and "Nothing Is Keeping You Here" have been replaced with "Rolling Thunder", "And You Tell Me", "Living A Boy's Adventure Tale", "Out Of Blue Comes Green", "Waiting For Her", "Here I Stand And Face The Rain" and "The Weight Of The Wind". The album comes in a slim-line double jewel case with a similar CD booklet to the European release, but with the track list altered accordingly. On the back sleeve, it displays that the album was; "Manufactured and distributed by Warner Music Japan Inc" and was "Made in Japan". The release also comes with a 45 page white booklet which includes all the lyrics printed in both English and Japanese. The discs are both silver with the usual a-ha logo on the left and the large "25" printed in the centre, the colouring is more transparent clear than the regular white. There is also instead a white centre ring for "DISC ONE" and a dark blue centre ring for "DISC TWO". Printed around the centre rings as usual is some Manufacturing, distributing and copyright information; "This Compilation ℗ & © 2010 Rhino Entertainment Company, a Warner Music Group Company. All Rights Reserved. Manufactured and distributed by Warner Music Japan Inc., a Warner Music Group Company. Unauthorized duplication, public performance, broadcasting, renting, copying and making transmittable of this disc prohibited. Made In Japan. WPCR-13946/7". The regular "WB Records" and "RHINO" logos are shown along with two additional "COMPACT disc DIGITAL AUDIO" and "JASPAC" logos. The promo edition is the same as the regular edition but has a white promo sticker with red text over the barcode on the back of the obi and "SAMPLE - LOANED" etched in orange letters around the centre of the discs. The Japanese album "25" was re-issued on the 7th December 2011 with a different branded obi-strip which is white with red, gold and black text. It also includes a gold and red "SUPER FANTASTIC BEST 2012" circled ¥2500 price tag at the top. Down the middle it displays a red a-ha logo with the Japanese title printed in black. The lower half of the obi-strip comes with some further Japanese text shown in white on a golden background. A black "WB" logo and red/white "RHINO" logo are also included, along with an additional red and white price tag. Some (if not all?) copies also have a pinky purple sticker with white Japanese text, showing the 2500 price on the front. The spine itself is also white and comes with a smaller version of the golden circular price tag at the top, with the red a-ha logo and black Japanese title down the middle. There is a black "2CD" logo, red ¥2500 price tag, blue "Warner Music Group" logo and Catalogue number WPCR 14350/1 in black at the bottom. The full track listing is displayed in Japanese on the back of the obi along with red track numbers shown alongside, there is a white barcode at the bottom, but uses a different number "4 943674 113170" compared to the original release. The release date 7.12.11, "COMPACT Disc DIGITAL AUDIO", "STEREO" and "JASPAC" logos are again additionally included. It also displays that the album was "MADE IN JAPAN". The actual layout of the album is very similar to the original pressing displaying the usual artworks and containing the same discs, but includes a revised Catalogue number WPCR 14350/1 throughout. The track listing on the back sleeve (unlike the first pressing) has some errors with some of the letters at the end of titles missing on disc two: "Dark is the Night For Al" "Cry WO", "The Weight Of The Win" and "Shapes That Go Togethe". This edition also includes the same regular colour artwork booklet and additional white 45 paged Japanese lyric booklet, plus it contains the same 37 tracks as the original Japanese release. Korea: The Korean edition is similar to the regular European release but comes with a much larger blue and white sticker with the text all printed in Korean on the front cover, the layout and font size of the text is different and appears to display some of the other tracks which are included on the album; "I’ve Been Losing You," "Cry Wolf," and "Manhattan Skyline". On the back sleeve, the white barcode at the bottom left hand corner comes with a different number "8 8092 17 579116" compared to the European edition, plus the Catalogue number for both the Korean and European releases are displayed; WKP2D-0189 / 8122 79796 8. There is also some Korean Manufacturing, distributing and copyright information, (all printed in English) shown along the bottom; "This Compilation ℗ & © 2010 Rhino Entertainment Company, a Warner Music Group Company. Marketed and manufactured by Warner Music Korea. Distributed by Vitamin Entertainment Co. Ltd., a division of Warner Music Korea. A Warner Music Group Company. Registration no. 1189 to the Ministry of Culture & Tourism. (2010.10) All rights of the producer and of the owner of the work reproduced reserved. Unauthorized copying, hiring, lending, public performance and broadcasting of this record is prohibited. Made in Korea. WKP2D-0189/8122 79796 8". The regular "WB Records" and "RHINO" logos are also included, along with the "www.a-ha.com" and "www.rhino.com" website addresses. The discs are the usual silver with white text and come with the same layout as the European release, the colouring on the centre ring of disc one is light blue, with disc two being instead dark blue. The text also printed around the centre rings indicate that that the album was "Marketed by Rhino Entertainment Company" and was "Made in Korea". The album also comes with the regular glossy colour booklet but displays the Korean Catalogue number WKP2D-0189 on the back cover, there is also a white paper double sided Korean information insert with some Korean history about the band and mini discography. Malaysia: The European edition was exported to Malaysia and comes with an additional light blue, grey and white "IMPORTED" sticker displaying the "WARNER MUSIC" logo and contact address details; "WARNER MUSIC DIIMPORT OLEH : Warner Music (Malaysia) Sdn Bhd Suite 2.1, 2nd Floor, Bangunan THK, No. 2A, Jalan 243, Seksyen 51A, 46100 Petaling Jaya, Selangor, Malaysia" at the bottom of the front cover. There is also a silver "TULEN KPDN & HEP ORIGINAL" hologram sticker included in the top right hand corner. Mexico: The Mexican CD release comes with the regular front and back cover artworks similar to the European edition but doesn’t include the blue and white sticker on the front of the CD case. An additional silver "ifpi" hologram sticker is displayed instead. On the back cover the Manufacturing and Copyright information is printed in Spanish and reads; "Esta compilacion ℗&© 2010 Rhino Entertainment Company, a Warner Music Group Company. Los derechos sobre el fonograma se encuentran reconocidos por la Ley Federal del Derecho de Autor. Se prohibe su produccion, reproduccion, importacion, almacenamiento, transporte, distribucion, comercializacion, venta o arrendamiento, asi como su adaptacion, transformacion y comunicacion directa al publico sin la previa autorizacion por escrito del titular. La violacion a esta prohibicion constituyen un delito y una infraccion, sancionados conforme a los articulos, 424 Bis, del Codigo Penal Federal; 231 fraccion III y 232 fraccion I, de la Ley Federal del Derecho de Autor y demas normas aplicables vigentes, incluyendo las de character internacional. Hecho en Mexico y distribuido por Warner Music Mexico S.A. DE C.V. A Warner Music Group Company. Marcas Registradas para su venta en Mexico. Leibnitz No. 32, Col. Nueva Anzures. 11590 Mexico, D.F. ; Tel. 5729-38-00". "La musica es cultura".The regular white barcode displaying the same number "0 8122 79796 8 3" as the European edition is shown, along with the "WB Records" and "RHINO" logos. An additional "WARNER MUSIC MEXICO" and Anti-piracy CD logo are also displayed. The layout and design of the actual discs are again silver with white text, but slightly differ compared to the European edition, they both come with a larger centre ring displaying some of the same Spanish Manufacturing and Copyright information which appears on the back sleeve; "Este Compilado ℗&© 2010 Rhino Entertainment Company, a Warner Music Group Company. Hecho en Mexico y distribuido por Warner Music Mexico, S.A. de C.V., a Warner Music Group Company. Prohibida la reproduccion y radiodifusion de este fonograma. Reservados todos los derechos del productor fonografico. L.C02982 8122797968". The regular "WB Records" and "RHINO" are also present on both discs. The album also includes the glossy 8 page double sided booklet with the grey and blue artwork pictures, plus English text about the band's career and history, along with the full track listings and credits information. The Catalogue number is 8122797968. Poland: The European release was available in Poland, it comes with an additional yellow and blue; "RMF fm NAJLEPSZA MUZYKA" sticker along the top of the front cover advertising the local Radio Station "RMF fm Best Music". There is also a red and white sticker at the bottom left, advertising a Polish music website accompanied with a slogan; "muzodajnia.pl najlepsza muzyka za grosze" (Best money for the buck), plus another blue and yellow (Shop for "Music" CD-MC-VHS-DVD T-SHIRTS) music website; "Sklep “Muzyka” CD-MC-VHS-DVD KOSZULKI, NASZYWKI Bydgoszcz ul. Sniadeckich 50 ☎ (52) 322 31 80 [email protected]", sticker located at the bottom right. The usual official silver "ZPAV ZAiKS" Cassette/CD hologram logo which appears on all Polish releases is also included on the front cover. On the back sleeve, there is an orange and red square sticker advertising Poland's largest TV channel "POLSAT". Russia: The Russian edition has similar artwork to the European release, but comes with an obi-strip. The obi-strip is blue and red with white text and small shots of the album covers of "Headlines & Deadlines" and "Lifelines". There is also a holographic "For sale in Russia" on the front of the album. The back sleeve has extra copyright and manufacturing information at the bottom, compared to the European release. South Africa: The South African edition was "Marketed by Warner Music Gallo Africa" and was "Distributed by Gallo Record Company". It is similar to the European release and includes the same blue sticker on the front of the CD case, but the Catalogue number displayed has been changed to CDESP369. On the back sleeve, the white barcode also comes with a different number; "6 001212 385330" compared to the European release, plus the Manufacturing, distributing and copyright information has been revised to read; "This Compilation ℗ & © 2010 Rhino Entertainment Company, a Warner Music Group Company. Marketed by Warner Music Gallo Africa. Distributed by Gallo Record Company. All Rights Reserved. Unauthorised copying, lending, public performance, and broadcasting of this recording prohibited". The regular "WB Records" and "RHINO" logos are also shown, but an additional "Gallo" logo has now been included alongside. The usual "www.a-ha.com" and "www.rhino.com" Website addresses are also present. The discs are again silver with white printed text, but the colouring on the centre rings is the opposite way around compared to the European release, disc one is now coloured dark blue, whilst disc two is coloured instead pale blue. The same South African Manufacturing, distributing and copyright information which appears on the back sleeve has also been printed around the centre rings, as has the regular "WB Records", "RHINO" and "Gallo" logos. An additional "RiSA" logo has also been added. The album also comes with the usual colour booklet, but displays on the back cover the South African "Gallo" Record Company Marketing and Distributing text with revised Catalogue number CDESP369 included. Taiwan: The Taiwan release of "25" was imported from the UK edition and comes complete with the regular "THE VERY BEST OF a-ha Celebrating 25 Years" blue and white sticker. The release also includes an additional light green obi-strip with a "WARNER MUSIC TAIWAN" blue logo at the top and two other "Pop" logos, one is printed in green on a black background, whilst the other is shown in white on a dark green background. The remainder of the text including the title is all printed in Taiwanese and displayed landscaped in black and green letters. The spine and back of the obi is also light green with black text, the spine again includes the blue "WARNER MUSIC TAIWAN" logo and green "POP" logos at the top, with the black Taiwanese title again landscaped down the middle. The Catalogue number 8122-79796-8 is printed in black at the very bottom. On the back of the obi-strip, the "COMPACT disc DIGITAL AUDIO" logo is shown in green at the top, with the title "A-HA 25 CD" displayed in large black and green Taiwanese lettering underneath. There is also some further Taiwanese text, all shown in black relating to the history of a-ha and their hit singles which appears on the album. A white barcode displaying the same number "0 81227 97968 3" as the UK edition is included at the bottom along with the "Warner Music Taiwan" contact address, telephone number "27158899", and website details; "www.warnermusic.com.tw". Sealed copies of the album also include the "Warner Music Taiwan" seal wrapped right the way around the CD case. There is also a Taiwan deluxe edition of album "25" which again comes with the same imported 3 part disc set (2CD + 1 DVD) as the UK release, but doesn’t contain the blue and white sticker on the front of the CD case. The release also includes the light green Taiwan obi-strip similar to the one used on Taiwan CD only edition, but the size of it is slightly larger and some of the text has been changed to include the wording; "2CD+1DVD". The top of the front obi and spine again shows the blue "WARNER MUSIC TAIWAN" and green and white "pop" logos, with the same band history and hit singles information credited on the back. The white barcode showing the UK number "0 81227 97904 1" has again been displayed at the bottom, with the same "Warner Music" contact details and website address. Sealed copies of the deluxe editions don’t appear to include the "Warner Music Taiwan" seal around the actual CD case. Thailand: The Thailand release is similar to the European edition showing the regular artworks, but comes with the additional "WARNER MUSIC THAILAND" blue and white "ifpi 399 uาn" price sticker at the bottom right hand corner of the front sleeve. 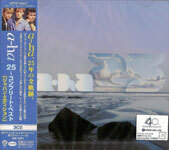 The usual rectangular blue sticker with the text; "THE VERY BEST OF a-ha Celebrating 25 Years" printed in white is also included at the top, but the edges come unrounded unlike the European release. On the back sleeve, there is an additional small white information sticker displaying some Thai text printed in black, the regular European white barcode displaying the same number "0 8122 79796 8 3" is included at the bottom left hand corner. At the bottom centre, the Manufacturing and distributing information has also been slightly amended to read; This Compilation ℗ & © 2010 Rhino Entertainment Company, a Warner Music Group Company. All Rights Reserved. Marketed by Rhino Entertainment Company. Unauthorized copying, hiring, lending, public performance, and broadcasting of this recording prohibited. Manufactured and distributed by Warner Music Thailand. LC02982". The CD comes with the regular silver discs with the large white "25" in the centre and "a-ha" logo on the left hand side. Centre rings are both coloured dark blue, rather than one disc being light blue and the other being dark blue. Also printed around the centre rings again in white, is the Thailand Manufacturing text which is similar to the back sleeve. The regular colour booklet is also included. The promo edition comes with a hole punched through the barcode on the black sleeve, plus the text; "PROMOTION ONLY NOT FOR SALE" is printed in black around the centre rings of the discs. Unlike the regular edition, the promo release doesn't appear to include any of the Thai stickers on the front and back sleeve. Ukraine: The Ukraine release of "a-ha 25" is similar to the European release and comes with the same catalogue number 8122797968, it was; "Manufactured in Ukraine by Comp Music Ltd". 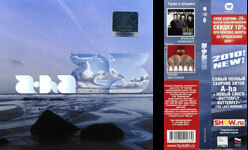 There is a silver hologram sticker on the back sleeve with the title; "A-HA "25 – The Very Best Of" in black and the words "КОНТРОЛЬНА МАРКА" in silver. The Manufacturing and Copyright Information also printed on the back sleeve differs compared to the European release to include some Ukrainian text; "This Compilation ℗ & © 2010 Rhino Entertainment Company, a Warner Music Group Company. All Rights Reserved. Marketed by Rhino Entertainment Company. Unauthorized copying, hiring, lending, public performance, and broadcasting of this recording prohibited. LC02982 Ліцензіат WARNER MUSIC GROUP GERMANY HOLDING GMBH в Україні - компанія Comp Music Ltd. Ліцензійна угода з WARNER MUSIC GROUP GERMANY HOLDING GMBH від 31.03.2010 Вироблено в Україні компанією КОМП МЮЗІК ЛТД. Україна, м. Київ-55, 03055, a/c 76.тел./факс:(044) 537-3661, e-mail: [email protected] www.compmusic.kiev.ua". The same white barcode, "WB Records" and "RHINO" logos are also included along with the "www.a-ha.com" and "www.rhino.com" website addresses. The release comes with the same regular colour insert booklet but includes the additional text; "Manufactured and distributed in Ukraine by Comp Music Limited" on the back cover. The discs are the silver with white text and come with the usual layout showing the large "25" displayed in the centre and the a-ha logo on the left. The centre rings are instead white for disc one and dark blue for disc two, they also come with an additional outer silver rim to again show the Manufacturing and distributing text which has now been printed in both English and Ukrainian; "Manufactured and distributed in Ukraine by Comp Music Ltd / Вироблено та розповсюджено а Україні компанією КОМП МЮЗІК ЛТД". USA: There is a "Digiprep" US acetate promo album of "25". They are a set of two discs which come in a jewelcase with insert. The front of the inserts are white with blue text at the top "DigiPrep Mastering" plus contact details in Los Angeles. "Warner Music Group" is printed in black under the blue titles plus the title and "ref disc only, not for mfg 5/21/10". The back inserts are also white with titles in black at the top and the tracks listed underneath. There are also white and blue DigiPrep plus white and green Rhino records stickers. The discs are white with blue DigiPrep titles at the top plus "Warner Music Group" and album titles in black underneath.